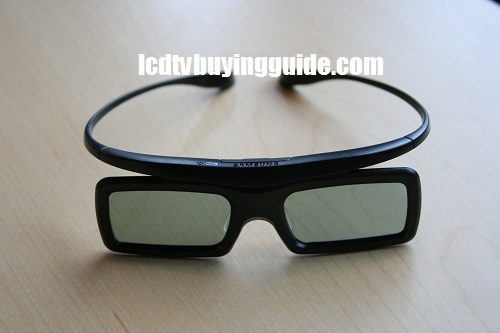 The UN55ES6580 includes 4 pair of 3D glasses and a Skype camera to add to the already impressive ES6500. 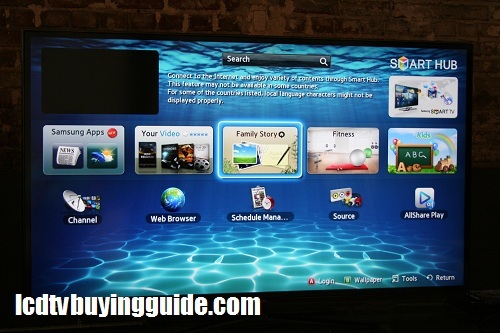 The UN55ES6580 has many of the best features Samsung will put out in 2012 while omitting some of the fancier ones like Smart Interaction by voice control. It's a super value model. Instead it has the exceptional clear coat screen with a 240Hz panel and 480 Clear Motion rate feature rather than the higher rates on the more expensive models. 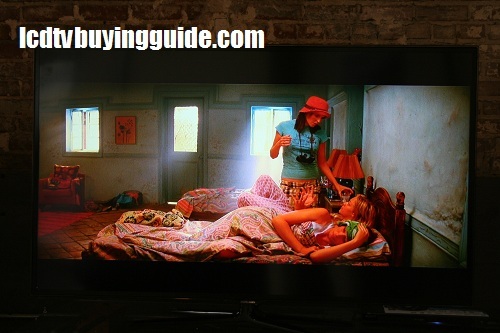 Though it does not apply to as many zones in the screen as the Micro Dimming Ultimate from the highest end Samsung LEDs, the micro dimming technology in the 55" Samsung UN55ES6580 works by localizing parts of the screen for more or less LED backlighting. It is a significant upgrade feature from last years 6000 series TVs and this years lower "6000" lines of LEDs from Samsung. It works well to help eliminate screen uniformity issues and does a good job in that area. The UN55ES6580 has the 480Hz Clear Motion rate equivalent processing (from a 240hz screen) which helps considerably with fast motion processing and motion blur. The true Hz rate of the panel is 240Hz but the Clear Motion feature upgrades the 240Hz through the above mentioned local dimming process to give you an "effective" frame rate of 480. Samsung is very proud of the vast array of Apps they are now providing and the Samsung UN55ES6580 has access to them all. There are over 1500 Apps – most of them small and priced between .99 and $2.99 but many are offered for free. Aside from that the usual premium channels options are also incuded. There is a new Search All feature to allow you to find videos via Apps or other connected devices as well. Social media hookups like Facebook and Twitter are of course present. The UN55ES6580 has a black matte .5” wide frame which is also black on the sides with the overlay panel running all the way to the metal frame sides. It's fairly minimalistic and there is nothing much to complain about, though it's not going to blow your socks off. The included black 4-legged quadrapod stand swivels left and right about 20 degrees. The front panel itself is a semi-matte finish so not as slick looking as those clear coat screens (such as LG Cinema Screen or Panasonic Plasma top units). 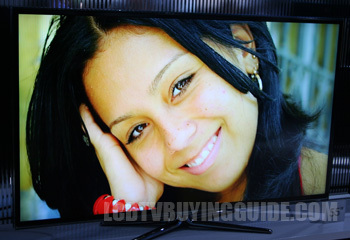 At $1698 the UN55ES6580 is a very good value with all of the above mentioned features and picture quality attributes. It's $100 more than the ES6500 and has 4 pairs of glasses rather than 2 and the Skype Camera. It's a loaded TV for this price. Some of the only features that it does not have such as Smart Interaction are not really worth it. The picture is also not as standout as the top tier models, but is still very good. 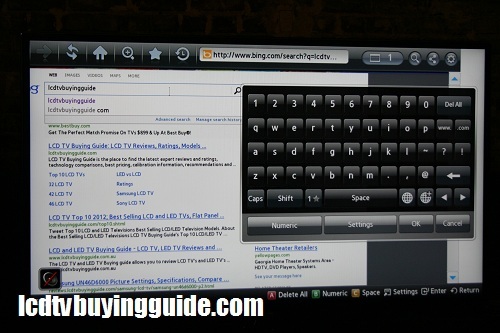 Competition is from the LG 55LM7600 and the Sony KDL-55HX750 and an assortment of plasma TVs such as the Panasonic TC-P55GT50. TV without stand: 49.6" x 29.2" x 1.2"
TV with stand: 49.6" x 31.9" x 10.9"